Original Sweet Hickory Steak SauceA. 1. has got the best range of steak sauces to complement all kinds of meat. A.1. 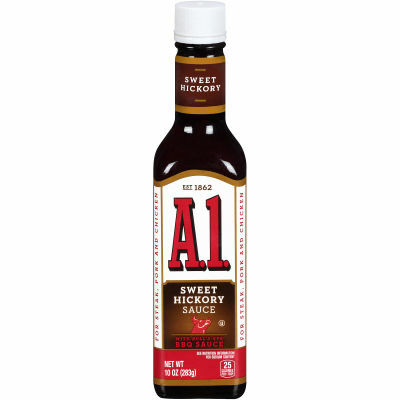 Steak Sauce and bull's eye BBQ sauce have teamed up to bring you A.1.Original Sweet Hickory Steak Sauce; a blend of flavors that's bound to take your steak from a meal to an enticing indulgence. Sweet, Smoky & Savory!A.1. Original Sweet Hickory Steak Sauce is a delectably tempting blend of premium quality ingredients such as, tomato puree, vinegar, raisin paste, salt, spice, dried garlic, natural flavor, dried onions, and celery. These ingredients simmered & blended to a tasteful sauce; tantalize your taste buds with the tangy, zesty, a little sweet & little spicy lip smacking flavors.